This exquisitely carved temple drawing millions of pilgrims from all over India for many centuries, is an important spiritual center. Over the years, members of royal families of the Shalivahan, Chalukya, Shilahar, Rashtrakoot, Kadamba and Yadava dynasties sought the blessings of this goddess. 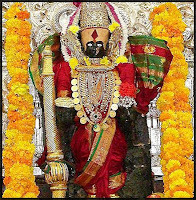 It is a family deity of numerous devotees. This deity is affectionately called as Ambabai. In the 7th Century the Chalukya King started the construction of the temple and later in the 9th century the Shilahar Yadava rulers beautified it in the Hemadpanti Style. Thousands of pilgrims from distant places come to this important spiritual place. 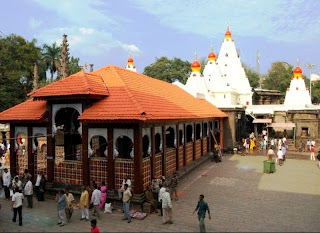 The temple complex, consisting of Garbhaghar, Sabha Mandap (Audience Hall), pillars, ceiling also houses the temple of other deities like Kashivishweshwar, Kartikswami, Siddhivinayak, Mahasaraswati, Mahakali, Shree Dattatraya and Shree Ram. 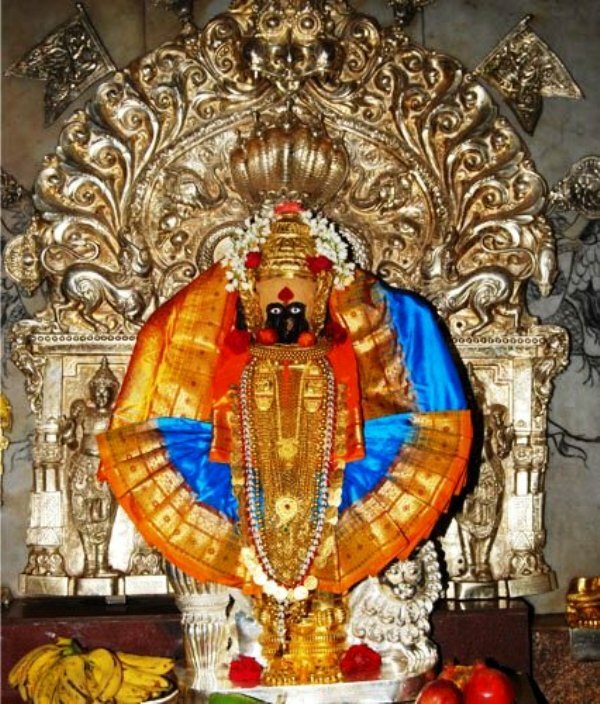 The sanctum Sanctorum houses the revered idol of the goddess, Mahalaxmi weighs 40 kgs., the idol is 'Swayambhu' (existing in its natural form). 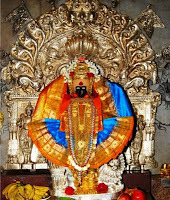 Three and a half feet tall, with the Sheshnag holding his hood like a canopy over the idol, it has four arms that hold a nectar filled cap, a mace and a Shield. Palanquin (Palakhi) is carried every Friday, besides there are celebrations on Chaitra Poornima and Navratri. The temple has a huge 'Garuda Mandapa' built in 1838. This mandapa holds music concerts wherein renowned artists perform their art before the deity as a service during festivals. Kolhapur is situated 383 kilometers south of Mumbai and is well connected by rail and road with the other cities in Maharashtra and neighboring states. Kolhapur city has a domestic Airport at Ujalaiwadi which has daily Air Deccan Flight to and from Mumbai. Thank you sir.... minimum lines maximum information. Thank....it was helpful for me.